New Orleans East is home to the most densely Vietnamese population outside of Vietnam. 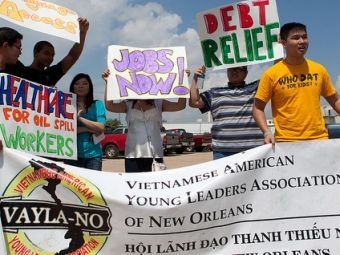 In the Gulf region, about 80 percent of Vietnamese-Americans were connected to the fishing industry. The BP oil spill hit these people hard. Majora Carter visits the community and meets with fisherfolk who are trying to rebuild their lives by opening gas stations and nail salons – while also dealing with the mental anguish that surfaces when a lifetime on the water suddenly disappears. Majora talks with youth and community organizers as well as local religious leaders to learn about how the community has rallied to support their fisherfolk.